One of the most significant experiences for many biology majors is their participation in an independent research project. Most faculty members have at least 3-5 independent study students who work with them in their research labs. 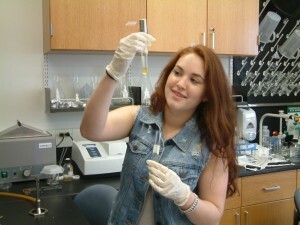 Students may become actively involved in research either during the academic year or over the summer, on campus, at other institutions, or at local corporations. Many students have presented the results of their research at state, regional, and national scientific conferences. Each year some students are co-authors on published abstracts or peer-reviewed papers. Participation in research experiences often are an important aspect of a success application for scholarships and fellowships, as well as admission to graduate school programs.